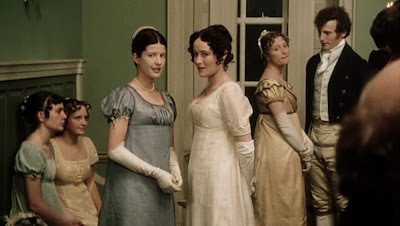 "It is a truth universally acknowledged, that a single man in possession of a good fortune must be in want of a wife." So said the first paragraph on the first page of my paperback copy of Jane Austen's Pride and Prejudice. In other words, I was hooked. Hilariously hooked. From the very first page--nay, the first sentence. The hilarity of the narrative, the fascinating characters, the funny and suspenseful situations... I had to pace myself to make the book last and not gobble it all down too quickly. I carried it around the house and read bits and pieces out loud to the family, cracking up over Mr. Collins and Mr. Bennet. Who'd-a-thunk early-nineteenth-century literature could be so funny? I'd picked up Pride and Prejudice at my mom's suggestion. I think she was tired of hearing me complain about the lack of good books to read (having just finished eighth grade, I was feeling too old for the Juvenile Fiction section at the library but uninterested in the vampires and werewolves roaming the shelves in Young Adult), so at last she said, "Why don't you try Jane Austen?" and the very next day she took me and the gift card left over from my birthday to our nearest Borders. Whereupon I purchased this volume and took it home to devour. Then, and only then, did I watch the 1995 miniseries with my mom. I'm a stickler for reading the book first and THEN seeing the movie, and once I'd finished the novel I was chomping at the bit to see the film. We checked it out from the library (one DVD at a time) and I. Was. Enthralled. Perhaps it was the superb acting, perhaps it was the hilarious wit, perhaps it was the lovely Regency costumes, perhaps it was the way the script stuck so closely to the book (an instant win in my mind) but I think it was a combination of all of those plus the fact that this was my current favorite book, come to life, that made this movie my favorite of all time. 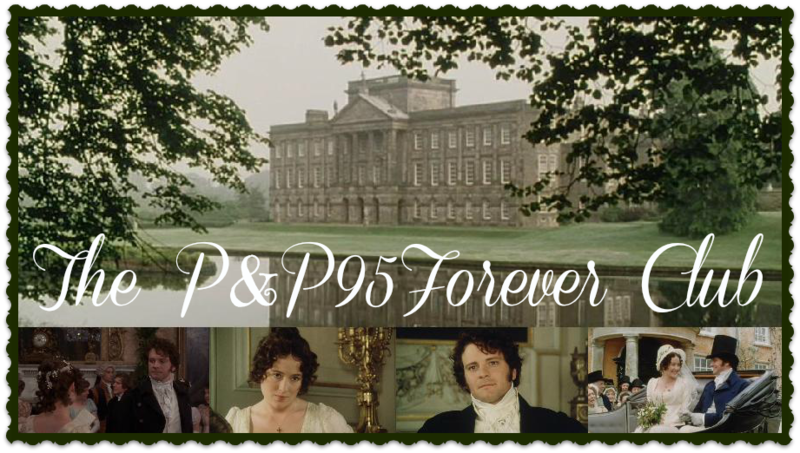 (For those curious, Sense and Sensibility is my favorite Jane Austen book, but P&P ranks very high after it.) And once I'd seen it, my love for Jane Austen took flight. And now... here I am, co-running a blog all about that movie. Who would have thought it? I was going to say "who'd-a-thunk it," but I am TRYING to be grown-up and sophisticated.